You do not need a PayPal account in order to pay your MyClient subscription. Although PayPal is the funds processor, you can pay directly from your credit card. Paying your MyClient invoice via our Credit Card processor will incur an additional 4% fee. If you are from a country which legislates restricted access to the USD, or if you otherwise cannot support a payment from PayPal or from a credit card, then please contact us about additional payment options including wire transfer. Any alternative arrangements may require longer contract terms in order to compensate for the additional administrative workload. Following your first free month of service, you will receive a monthly subscription invoice by email. Click the link illustrated below. Note, if you have difficulty clicking the link, you may need to copy and paste it into a browser. When you click the link, you will be directed to a web page, showing a copy of your invoice. At the top of the page, there will be two buttons as illustrated. This is the recommended method for making regular, automated payment of your MyClient subscription. It does require you to create a PayPal account, however the payments will simply be deducted directly from your credit card, just like a normal credit card subscription payment. Click the PayPal Subscribe button. You will be directed to the PayPal subscription system in order to set up a new subscription. If you have a PayPal account and wish to use that for your payment, then enter your credentials. Otherwise, click the link indicated below. On the following screen, you will need to enter your details, and the details of the credit card you wish to use for your payment. Complete the required fields and click continue. You will then be asked to confirm your subscription. This method requires you to make a manual payment for each invoice you receive. 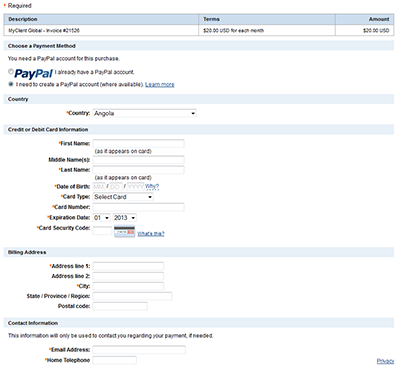 Click the PayPal Check Out button. You will see the screen below. If you have a PayPal account, you can enter your account details to make the payment. If not, please click the link indicated to make your payment from a credit card. Complete the required fields on the form. 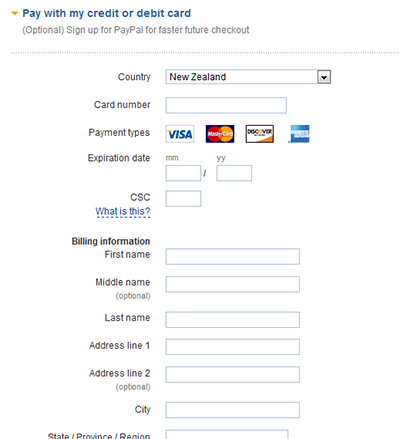 Note, in some countries, PayPal requires you to create a PayPal account so the form may differ slightly, and you may be required to choose a username and password. Once complete, click the button at the bottom of the page to confirm. Please use the links on the invoice to pay directly by Credit Card. Having trouble finding your invoice? Visit http://support.myclientglobal.com/ and login to your account. Once logged in, you will see your account details and a list of unpaid invoices. Click "Pay All" to pay all of your outstanding invoices, and then follow the method described above.